I hope that you all had an amazing Labor Day Weekend! I loved every minute of it except for when I had to go to the ER after an allergic reaction to antibiotics. My face and mouth blew up like a balloon (think that scene in the movie “Hitch” with Will Smith) that part wasn’t that awesome. But the steroids I’m on to take down the swelling sure are making me hungry. Like SO hungry. So hungry that I decided to make lunch right when I got back today. And it happened to be breakfast for lunch! 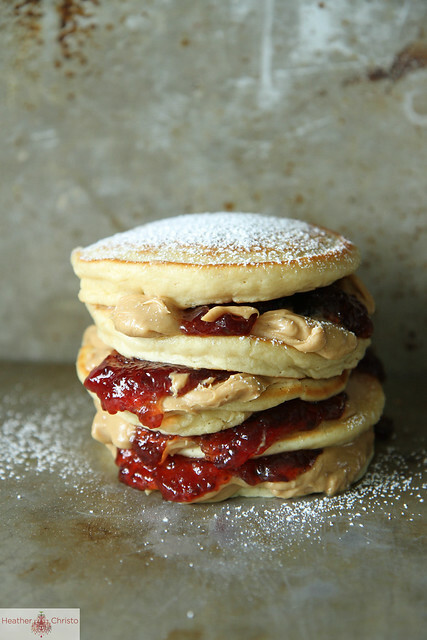 I wasn’t going to share this for another week, but I enjoyed my Peanut Butter and Jelly Pancakes SO much that I think I need to share the recipe right away. It comes from the new book “Weelicious Lunches” by my friend the lovely Catherine McCord. McCord writes the blog Weelicious and is as beautiful on the inside as she is on the outside (and that is saying something). Catherine is truly dedicated to her children and to the art of feeding them healthy, nutritious and whole foods. I feel like I have a lot to learn from her. When I received a copy of her latest book “Weelicious Lunches” I was filled with a certain hopefulness. I am one of those parents that struggles endlessly with making lunches for my kids. I am cool if they are up for last nights leftovers thrown in a tupperwear, but otherwise I tend to flail a bit. Let me tell you this, McCord does not. Hers are those lucky children who get adorable and healthy meals in sassy bento boxes, not soggy sandwiches in sad paper bags. This year I have decided that I will be more like McCord. It feels like a New Years Resolution- I can do it!! So I wanted to share a recipe from her book with you, and after perusing the tons of shiny photo’s, I selected her Peanut Butter Pancake Sandwiches- mostly cause they just sounded really good. I also thought to myself “I bet my kids would actually eat these! !” which is unfortunately becoming a more and more unusual thought these days. And indeed, Pia did eat these. I was the one gobbling them down sandwich style filled with PB&J, and she preferred them plain sprinkled with powdered sugar. These look so yummy! I love fresh buttermilk pancakes with syrup, but I also love smearing the leftovers with peanut butter later in the day! ***Please feel free to tell me your favorite kind or way to eat pancakes below and you will be entered to win a copy of “Weelicious Lunches.” This contest ends on Sunday September 8th at 9Am PT and then I will promptly announce the winner on twitter, facebook and at the bottom of this post. Thank you!! In a separate bowl whisk together the peanut butter, egg, sugar and buttermilk until smooth. 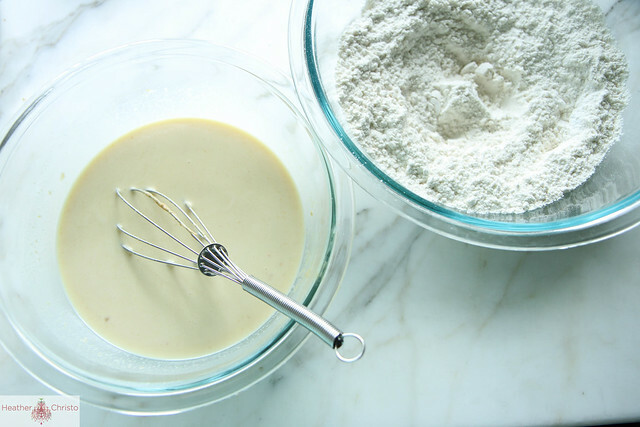 Add the wet ingredients to the dry ingredients and whisk until you have a just combined batter. Heat a large sauté pan or griddle to medium heat and grease with the canola oil. 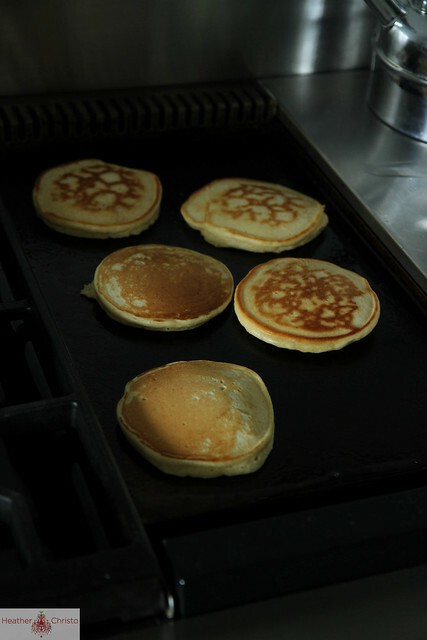 For each pancake drop about ¼ cup of the batter onto the hot griddle and let cook about 2 minutes on each side or until golden brown. Spread the peanut butter and jelly between pancakes and dust the tops with powdered sugar if desired. 1. In a medium bowl whisk together the flour, baking powder and salt. 2. In a separate bowl whisk together the peanut butter, egg, sugar and buttermilk until smooth. 3. Add the wet ingredients to the dry ingredients and whisk until you have a just combined batter. 4. Heat a large sauté pan or griddle and grease with the canola oil. 5. For each pancake drop about ¼ cup of the batter onto the hot griddle and let cook about 2 minutes on each side or until golden brown. 6. 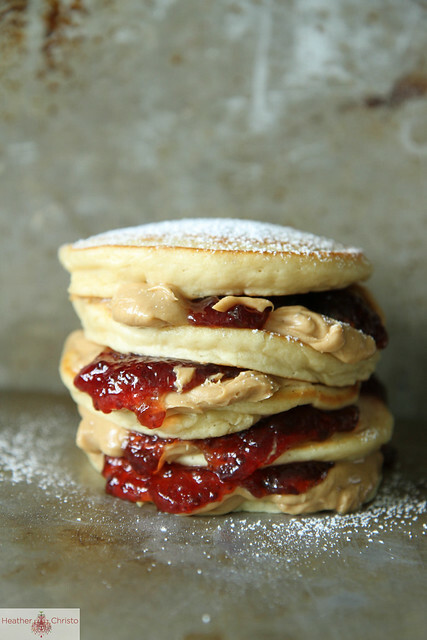 Spread the peanut butter and jelly between pancakes and dust the tops with powdered sugar if desired. These pancakes look amazing. That picture drew me in like honey to a bee! My favourite way to eat pancakes, is any way. Any way at all. Ok, first of all I am so sorry to hear about you allergic reaction. Such a bummer and I hope you are feeling better! I would have totally come home and made pancake too! Especially these! Oh my gosh, they look so giant and fluffy and amazing! Wow oh wow! I need this cookbook! These look yummy! Right now my favorite pancake is blueberry orange from joy the baker. Oh no! Allergic reactions are definitely no fun 🙁 I remember I had one with a nutrition supplement. Oh man, itchiest face ever!! Love these pancakes. Wish I had a stack! Next time the granddaughters spend the night I’m making these! They wanted pancakes and I was out of butter so used coconut oil with powdered sugar and a little maple syrup. Holy cow what a combination! Hot or cold with maple syrup! Those pancakes look so light, fluffy and good! September 3, 2013 at 7:39 am	 Alison C.
My favorite pancakes include pecans and coconut! But I bet my 3yo would love these PB&J ones! Mmm…I love all kinds of pancakes, and I love having pancakes for dinner occasionally. My favorite right now would probably be fluffy ricotta pancakes with chocolate chips. We love pumpkin chocolate chip pancakes. We make a BIG batch and freeze the extra for rushed mornings. I’m excited to try this recipe and see if its a new favorite. I want these for lunch….everyday!! My favorite kind is chocolate chip! so yummy! These are on my must make list. Love Catherine and her new book! That looks incredible! I would eat pancakes any way! Those look super fluffy. These pancakes look incredible! Love me some pb & j! Sorry to hear about the allergic reaction Heather. Sounds scary and very uncomfortable! Your PB&J pancakes look scrumptious and I know my picky 3 yr old would scarf them down in an instant! My favorite way to eat pancakes is stacked with layers of criss-crossed crispy bacon and with plenty of real Vermont maple syrup! Oh good Lord. These look AMAZING. My favorite pancakes are made from buckwheat, & I make a Bananas Foster type topping to spoon over the top. They are PERFECT for holiday breakfasts! OMG- So glad to hear you are okay. That’s a horrible allergic reaction! My son would devour with these. Agreed love Catherine – so much talent and sincerity. PB&J was (and still is!) one of the few things my younger son (who is now 17) likes to eat. He would have starved to death as a young child if we didn’t have PB&J. These look sooo yummy! I think they would bring out the kid in any of us. Yeah, I can see myself shoving these right off the griddle and into my mouth. Hope you feel better soon, Heather! Allergic reactions are a *****! I am partial to buttermilk pancakes with diced apple … served with butter and HONEY. My grandfather raised bees, so I am partial to honey on my breakfast breads over syrup. September 3, 2013 at 12:16 pm	 Abigail D.
I LOVE chocolate chip pancakes!! Then my second favorite is with PB&J!! Just found your blog through Twitter — I’m so sorry to hear about your allergic reaction! Those sound so frightening and I’m glad you’re okay. My absolute favorite way to eat pancakes is with Reese’s Pieces, haha! I’m such a kid at heart. I sprinkle them over the pancake batter in the pan before flipping them. How fabulous do these look?! Those layers of PB &J are perfection! yay for pancakes and yay for Catherines new book!!!! Glad you’re feeling better lady! Yummy! These look so good! Hurrah for Catherine!! with butter, toasted pecans & real maple syrup! I like my pancakes with whipped cream, maple syrup, and pecans. My girls are pancake fanatics!! They would eat them every day if I would let them. They like to eat sausage sandwiches using pancakes. I love pancakes with toasted pecans, real butter and syrup. 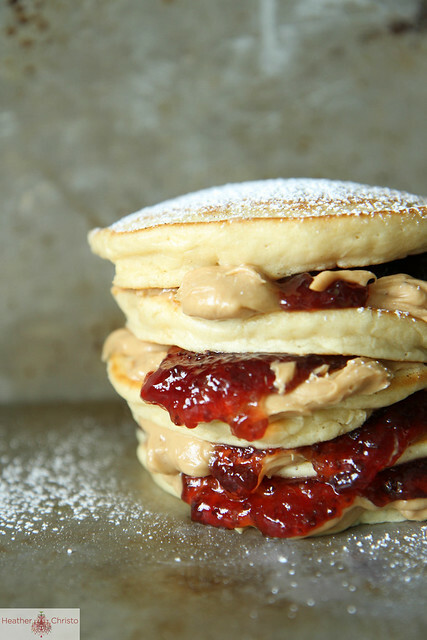 These PB&J pancakes look amazing! I can’t wait to try them! Oh my goodness, these are the fluffiest pancakes I’ve ever seen! Look delicious! 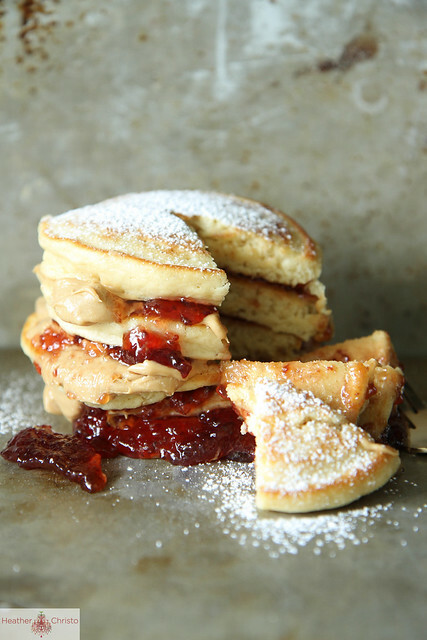 Pingback: 14 Ways To Instantly Upgrade Your Peanut Butter And Jelly (RECIPES) | Everyfoodrecipes, cooking tips, and how-to food videos—all rated and reviewed by millions of home cooks,make the perfect birthday cake, or plan your next holiday dinner. I’m going to make these with oat flour. I’ve been dying fora PB&J sandwich for a year & 1/2. This will be gluten free and yummy for me!!! Whoa. I just made these and they’re incredible. Fluffy and squashy and absolutely delicious. Thank you! These look incredible! I definitely need to give them a try…so fluffy!